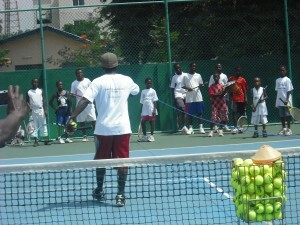 The Donkor Tennis and Education Foundation, Inc. is a 501c3 registered non-profit charity. The foundation was founded to provide guidance, information, sports training and mentoring to children and young adults with the intention of reducing poverty and increasing opportunity. Isaac Donkor, the founder and CEO of the foundation, grew up in Ghana, facing hardships and poverty unknown and unimaginable to most of us. Yet through tennis he was able to lift not only himself but his entire family and many friends out of poverty. Being helped by so many on his journey gave Isaac the inspiration to begin his own charity in the hope that other children can have the same dreams and success he has had. Our board of directors worked tirelessly to form this charity with the only focus being on helping young African athletes to fulfill their potential in tennis and education and to be given the same opportunities as children from the USA and other developed countries. The directors consist of a group of individuals dedicated to making this project happen all of whom have in-depth knowledge of tennis and business skills to bring this foundation forward. Through training programs and partnership with companies, these young adults will be more prepared to enter the world of sports and excel within their chosen sports career. As a result, these young men and women will be best suited to improve their living conditions and that of their community as a whole.